Ornamental Olive Low FruitEvergreen shrubby tree. Pruned to have a single trunk. 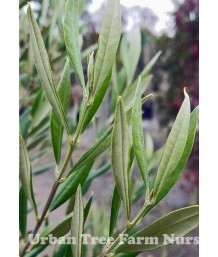 Narrow and long gra..
Fruitless OliveEvergreen shrubby tree. Pruned grow along a stake in the center of the container. Dwa..